Daniel Davis is an IT professional and Youtube personality with an insatiable curiosity and a propensity for tinkering. Using his desire to constantly learn and share what he's learned, Daniel founded the STEM focused Tinkernut, LLC (www.tinkernut.com) to teach people more about tinkering, hacking, and programming. His efforts through Tinkernut, LLC have been featured and published in several major websites, blogs, textbooks, and magazines. Aside from learning and teaching, Daniel is also an active supporter and member of local maker spaces and maker space initiatives. Bought the book to support the cause. The book continues the good information and ideas for using old products or technology in interesting ways. 5.0 out of 5 starsLiked the book! 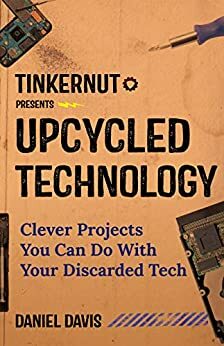 This was written in such a great way that its a pleasure to read, and contains the best projects that Tinkernut made so far from his YouTube channel. All I have to say is you've done a great job and congrats for turning the idea of writing a book into a reality!